The crust shares the limelight with the filling in this special tart, and the toasted almonds are really the star. It’s a press-in-pan situation, so you can leave the rolling pan in the drawer, which simplifies things a bit. The custard is fragrant and silky and almost doesn’t need the cloud of whipped cream … but why not? Cook’s Note: It can be a little hard to tell when the chocolate tart shell is done as you can’t use color as a gauge, so just set a timer and trust that when it cools, it’ll firm up just fine. Feel free to prepare the tart shell up to 2 days ahead of time and wrap with plastic wrap until ready to fill and serve. As for what to do with that leftover coconut milk? I like to add it to smoothies, soups or my morning oats. Make the crust: Preheat the oven to 325 F. Grease a 9-inch tart pan with a removable bottom with butter. Add the flour, cocoa powder, sugar and salt to the bowl of the food processor and pulse a few times to mix. Add the butter and pulse until the dough comes together in clumps and the butter is thoroughly combined. You’re looking for a very clumpy, moist dough. Turn the mixture into the prepared tart pan and press evenly into the bottom and up the sides. Prick the bottom of the crust with a fork and place in the freezer until firm, about 15 minutes. Once chilled, place the tart pan on a rimmed baking sheet and bake for 25 minutes, or until the crust feels dry to the touch. If the crust starts puffing up in the oven, take the back of a spatula and gently press it into the bottom of the crust to help it hold its shape. Remove tart shell from oven and set aside to cool. Make the filling: Decrease oven temperature to 300 F. Spread coconut on a small, rimmed baking sheet and bake until golden, stirring occasionally, about 5 to 7 minutes. Set aside to cool. In a medium heavy duty saucepan, heat the milk, coconut milk, sugar, and salt over medium heat until the mixture is hot and just starting to bubble. Remove from heat and set aside. In a medium bowl, whisk together the cornstarch and egg yolks. Slowly drizzle in 1/3 cup of the hot milk mixture, whisking as you go. Pour the egg mixture back into the big pot of hot milk and cook on medium-low heat, whisking constantly, for 5-6 minutes or until mixture is nice and thick and easily coats the back of a wooden spoon. Stir in the vanilla extract. Strain through a fine mesh sieve and into a shallow glass or ceramic bowl. Let the custard sit and at room temperature for 10 minutes, then cover with plastic wrap and refrigerate until cool, 50-60 minutes. Once the custard is cool, prepare the whipped cream topping: In a medium bowl, beat the cream, sour cream and sugar with hand beaters on medium speed until soft peaks form. 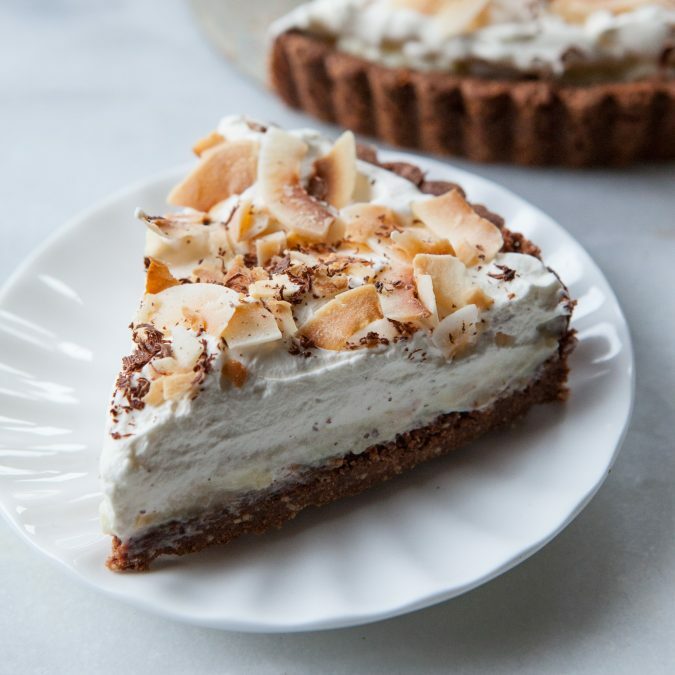 Assemble the tart: Spoon the cooled coconut cream filling into the prepared crust and spread evenly. Spoon the whipped cream filling on top and spread evenly. Sprinkle toasted coconut and chocolate shavings on top. Refrigerate until ready to serve. Remove sides of tart pan, and slice. Cover leftover tart and refrigerate for up to 2 days.